Creation versus evolution. Nature versus nurture. Free will versus determinism. Every November at the University of Chicago, the best minds in the world consider the question that ranks with these as one of the most enduring of human history: latke or hamantash? This great latke-hamantash debate, occurring every year for the past six decades, brings Nobel laureates, university presidents, and notable scholars together to debate whether the potato pancake or the triangular Purim pastry is in fact the worthier food. opportunity for both ethnic celebration and academic farce. In poetry, essays, jokes, and revisionist histories, members of elite American academies attack the latke-versus-hamantash question with intellectual panache and an unerring sense of humor, if not chutzpah. 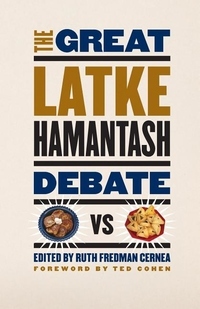 "The Great Latke-Hamantash Debate" is the first collection of the best of these performances, from Martha Nussbaum's paean to both foods in the style of Hecuba's Lament to Nobel laureate Leon Lederman's proclamation on the union of the celebrated dyad. The latke and the hamantash are here revealed as playing a critical role in everything from Chinese history to the Renaissance, the works of Jane Austen to constitutional law. Philosopher and humorist Ted Cohen supplies a wry foreword, while anthropologist Ruth Fredman Cernea provideshistorical and socialcontext as well as an overview of the Jewish holidays, latke and hamantash recipes, and a glossary of Yiddish and Hebrew terms, making the book accessible even to the uninitiated. The University of Chicago may have split the atom in 1942, but it's still working on the equally significant issue of the latke versus the hamantash.